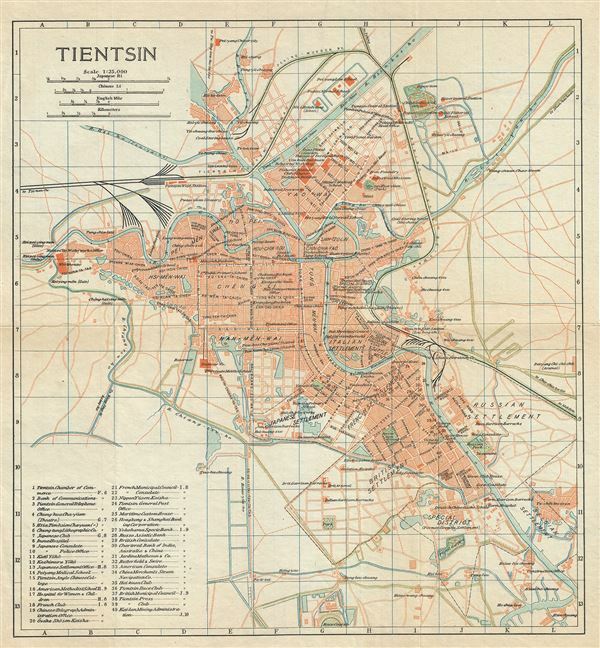 This is a beautiful 1924 railway map of Tientsin or Tianjin, China, by the Imperial Japanese Government Railways. The map depicts Tianjin, the fourth largest city in China in great detail, noting streets, individual buildings, rivers, railways, and other topography. Tientsin was a major trading center in Northern China and, like Shanghai, had administrative concessions to several foreign nations including England, Italy, France, Austria-Hungary, Belgium, Japan, Germany and Russia. Many of these concessions are noted on this map. Also notes several railway lines. This map was issued as part of the 1924 Official Series Vol. D of the Guide to China and printed at the Toppan Printing Company.